What the heck is that you ask? The latest hot declutter trend. That’s what. I’ll explain how it works practically in a moment. But first, why it is so important and how it can help big time, if you – and your family – are drowning in clutter. And feeling utterly rubbish about your total inability to get rid of it or stop more coming in. 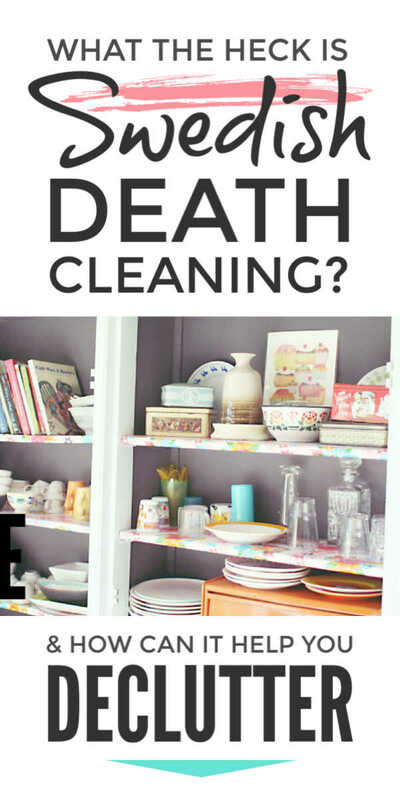 The Gentle Art Of Swedish Death Cleaning was written by Scandinavian grandma Margareta Magnusson and has been a big bestseller because it has a new take on the crazy epidemic of clutter we are all facing. Clutter is literally a disease that is causing misery in households across the world and seriously hurting our families’ mental health. Many of us are getting into debt filling our homes with stuff that doesn’t make us happy. And then do you know what we do? We cling on for dear life to all that stuff making us miserable AND finally pass it onto our kids. Or our grandkids. Or some distant relative. Because wading through rooms and boxes and garages and basements and attics full of clutter will really make our family happy when they’re grieving and overwhelmed, huh? When we step back and look at ourselves, it’s crazy. Why the heck would we keep doing something that makes us so unhappy? And then dump all that misery on our loved ones? And it’s these villains Magnusson takes on in Swedish Death Cleaning by unleashing a secret power we may not realise we have! I’ll explain now how these baddies took over – we’ll dive deeper into the psychology – but if you’ve got the gist, whizz to section 3 for Magnusson’s practical ways to fight back. As humans we instinctively like stuff. All the pretty, shiny, useful stuff we dream up and make with our clever hands. And from when we’re tiny, we grab at it. We do this, partly because it’s pretty and clever, but partly because we’re anxious. I mean, the world’s a scary place isn’t it? And stuff comforts us. Sort of. We think. But when our clutter instinct joins forces with our hoarding instinct and our fear of death, oh boy, we are in trouble!! Back in the day, hoarding was useful. It got us through bad winters and famine. And fear of death is pretty essential for survival isn’t it? However, they both increase our natural tendency to grab at and cling to stuff and throughout history we humans have got ourselves into a right old mess with clutter. Take the Egyptians for example. They tried to take all their clutter with them when they died, rather than palming it off on their relatives. I’m not sure which is crazier! But basically whenever times got tough – Game of Thrones style – we humans hoarded. Our world was turned upside down and we didn’t know how it would turn out, so we held onto stuff. Lots of stuff. Just in case. Which is understandable. If there are monsters on the march, we want to be ready for them. And most of us had a secret weapon to keep our hoarding sensible: we were just too poor. BUT 200 years ago, a new monster appeared. A Frankenstein, we created ourselves. Suddenly, the clever machines – we humans invented – could create clutter at a volume never seen before in the whole of history. Even poorer people could indulge in more pretty stuff. And it soon became a problem. Victorian novels are full of characters who collect stuff. And can’t stop. Authors like Charles Dickens saw the monster for what it was: an addiction dragging families into debt. And Dickens know this first hand. His dad, John went to prison because he kept buying pretty china plates, he couldn’t afford. How crazy is that? His family ended up in prison with him because he couldn’t stop shopping for stuff he already had!! BUT these days crazy clutter hoarding is an epidemic. And MOST of us suffer from it. So don’t think clutter is your personal failure. It’s not. Today’s machines let some people capture huge wealth by spewing out crazy volumes of clutter at lower and lower cost. Skilled jobs are lost but the clutter keeps coming and every day we are bombarded with stuff at cheaper and cheaper prices. Clothes. Toys. Gadgets. Furniture. Food. Entertainment. More AND more of it. It’s more than we could ever have space for. More than we could ever have time to enjoy. BUT it is so hard for us to resist, because we are human and we like stuff and once that stuff has invaded our homes, it is even harder to let go. And because we are scared of dying, we dump our crazy clutter on our families when we die. It’s all totally understandable. But it is no less crazy than the Egyptians burying their clutter in their pyramids and we have to do something. Honestly the emails I get in response to my declutter newsletter are heartbreaking. People are hurting out there. So the last thing we want to do is pass on that pain to our loved ones. And this is where Margareta Magnusson’s The Gentle Art Of Swedish Death Cleaning comes in. 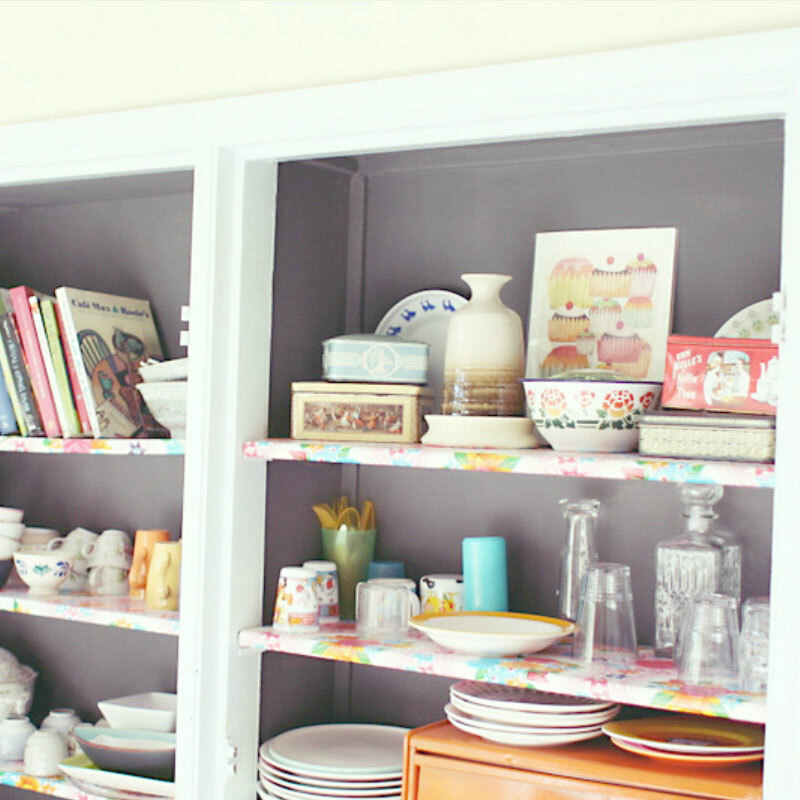 Her simple advice helps us slay the clutter monster right here, right now, so we don’t bequeath the battle to others. She did this as a pensioner – who’s had 5 kids and 17 different homes! – but her approach is relevant for all of us, however old, and really highlights that decluttering is a family affair. And it all starts with one big declutter question, Magnusson tells us to ask. The magical power of this question is that it makes us start talking honestly in our families about the few things that truly make us happy. And this unlocks a way to let loads of stuff go that is incredible joyful: and that’s gifting. It might all sound a bit airy fairy but it is easy to put into practice with these simple steps. Talk to all your friends and if they can enjoy more something you don’t love, gift it. This thoughtful gifting away of belongings brings deep joy. And we shouldn’t wait til old age to do it. As we move through milestones in our lives, we need to pass on things that will now make other people happier. This is a brilliant habit to get kids into. It really helped my 9 year old let go of toys that will make someone else happier. And once you start looking at stuff in that way, it’s amazing how much it frees us to let stuff go: all those craft supplies, books we’ll never read again, the kitchen gadget still in it’s sealed box. Someone else could truly enjoy them. But it also lets family and friends be honest about stuff they don’t love and don’t want. And which we need to “gift” in a different way. Which seems blindingly obvious, doesn’t it? But it is now much easier to pass this stuff on because we have got into the “gifting” mindset. It turns out, we have a deep instinct to “give gifts”, which we can use to fight the monster our hoarding instinct has become. So the “gifting” mindset can be super helpful for people who totally resist decluttering. It appeals to all our better angels, and may just be the breakthrough you need, for hoarders in your family, old or young. Gently create opportunities for them to gift. Rather than nagging them to declutter. The huge power of this – like lots of the ideas in Swedish Death Cleaning – is it makes us look at our clutter differently. And not just us but our families too. The book is a must read for baby boomers. 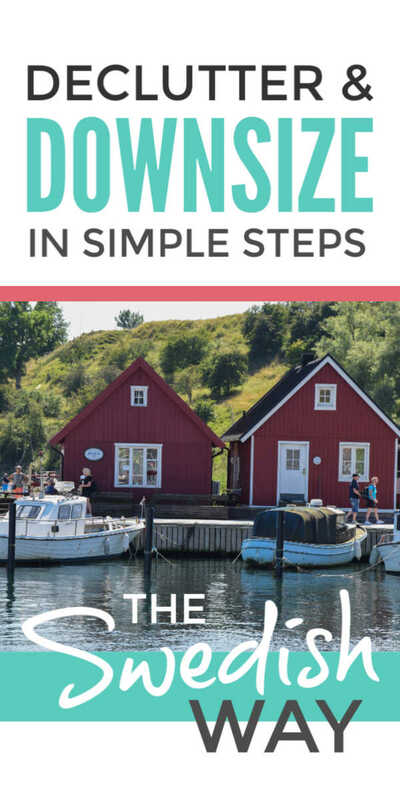 Magnusson combines handy tips on downsizing your way to retirement freedom with refreshingly honest advice to avoid dumping clutter on your kids when you die. Focus on what makes us happy and stop worrying about the rest and let it go. If you’ve struggled to declutter, Margareta Magnusson’s Gentle Art Of Swedish Death Cleaning could be your breakthrough. Especially if you’re drowning in your partner’s, kids’ and parents’ clutter as well as your own. The secret power of gifting may be just what your family needs to start fighting back and defeat the the clutter monster. A brilliant article. There is a emotional relationship to our clutter. My mother was a hoarder, brought up in the war years when rationing was on. She saved everything “just in case”, and when she did have a bit of money she couldn’t resist a “little bargain”.It was a nightmare sorting through bags, boxes and piles of inner soles, garden trowels, string, even sweets.Mostly out of date! I think I kept about five items in total. And I felt so rotten just disposing of her things, but it was just rubbish! I’m not much better because I kept everything my scalp of paper my kids scribbled on, every ticket to shows, school reports, bit of memorabilia to do with their childhood. This week I have sorted through it all and put it in a memory box, throwing a good 50% away before handing to them. I know why I did it, and it’s taken me years to change the habit. I’m only 51 but I don’t want my kids to have the stress of thinking they can’t throw stuff away because maybe it was precious to me. Its up to the individual of course but I’d also rather help my adult kids now when I can, when they need it. So while I declutter I offer it to them now. Mostly they go “No thanks mum!” so maybe I’m more like my mum than I’d care to admit! Wonderful article… I had a wakeup call when my friend’s husband died a few months ago. A couple of friends and I helped her sort out her house because she was downsizing…. what a nightmare that weekend was!! Anyway…. I vowed I would not leave my daughter a similar disaster when I die. 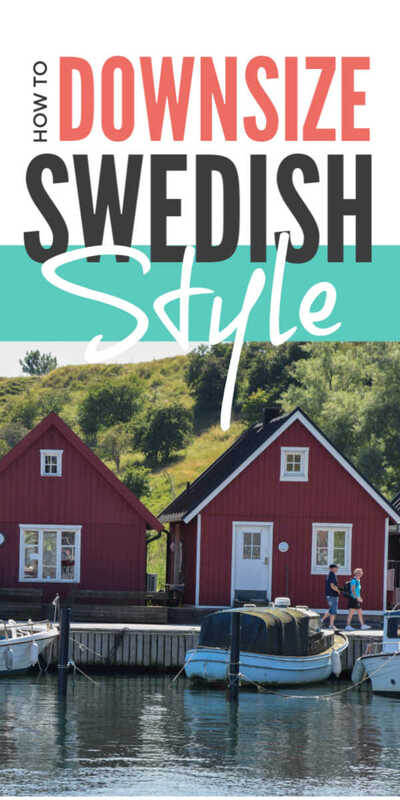 That idea… which is the Swedish Death Ckeaning :), has helped me declutter my home!! And I am sooo thankful I did start! Filling bags and bags of junk that has been sitting in drawers unused for years… I actually felt embarrassed, but also grateful that I am doing it and not leaving my poor daughter to deal with it!!! Another good hint for keeping or not is to imagine I am moving to another house, and I ask myself “would I take the time to pack this, transport it and unpack it? It’s such an eye opener isn’t it Celeste when you go through it? Just overwhelming to have to declutter a loved one’s things in all the pain of losing them. I like your moving tip it’s a good one. I’m 35 and this idea is so spot on. God forbid something would happen to me or my husband I would t want my family left to deal with junk. I’ve started throwing so much out weeks ago and my house feels lighter. I feel lighter. That’s so great Colleen. I know totally what you mean when you say you feel lighter – it’s wonderful isn’t it? Love this article. It touched me because I had the ‘pleasure’ of cleaning out my parents home of 52 years of clutter. My mother was such a hoarder, I found items from her first husband which she divorced in the late 60s. Later in life she was the $1 store queen. I wanted to cry at the dishes and silverware she only used at holidays. Some I use in my home daily. The pain of cleaning out my parents home, made me do 2 things: if I don’t love it, don’t buy it and come home and declutter my own home. My mother felt she needed to keep stuff in case somebody could use it or because she didn’t like empty spaces. She kept stuff in her basement that she no longer used later in life because, she didn’t want any ’emptied out’ space in her house. So glad you liked it Norma. It really is a painful process isn’t it? And so sad when we have lovely things like your mother’s dishes we have no space or time to enjoy because of all the totally-not-lovely-at-all clutter we cram our houses with. Love this. After inheriting dead relatives stuff and cleaning out two houses we are over it. Now we are purging our own house to releive burdens from our children and grandchildren. Thank you. When my mom and her sister passed away,my sisters and I each took what we wanted. They had lovely things. But their childhood home was filled with beautiful things. We donated huge amounts. When I had to downsize this last year,it was awful. I sadly parted with family pieces that I simply couldn’t use. It was painful and I was filled wirh guilt. Now settled into a small house I have unpacked the small important things. These are all I can display. I now feel more at peace. Many boomers are going to need institutional care of some sort. I am one. I have also seen what hoarding can do. The fact is nobody can use most of it, It means little to someone else. My problem is books and useless kitchen gadgets that only show up after the meal. So yard/garage sales, charity donations, used book stores or sales for charity ( put it back where I found it.) Do I need the empty bookcase etc.? I finally had a frank conversation with my mother. I rent and move every few years. I can only take the useful and a few sentimental peices. I have no idea what is my great-grandma’s, grandma’s, grand-uncle’s etc. I told her she has to curate and catolog for myself and my 2 half siblings or it will just be picking a couple of “shinny” things and donate the rest. She agreed with me. Hearing that I was willing to help with the attic, her significant other went and rearranged so I would have room to work up there. It truly is an epidemic problem. Great tips! I had never heard of Swedish Death Cleaning, but from experience, I know that it’s not a good idea to leave clutter to the next generation. I’ve had to declutter after my parents passed away and it’s a difficult task! Thanks for writing. I was shocked by the name of this method when I first heard about it, but it makes so much sense. I will say that as the person that has been in the role of “declutterer” after a loved one has passed, I really wished we’d had discussions about the stuff earlier. Not only is it a physical task to sort through stuff, it’s an emotional one. It was difficult to decide what was meaningful and worth keeping and what could move on. It would have been wonderful to know the story behind the stuff and to start the purging process WITH the person that we were grieving. I get this completely – but in some way, clearing out a persons home and belongings is almost part of the grieving process – a chance to laugh and reminisce and get surprised and cry over old cards and photographs. I am in two minds after clearing out my fathers house after he had passed last year – as it was cathartic but I am now left with a lot of his stuff which I just couldn’t bear to part with but won’t be used. I might need to read this book! This is a great article. I have made great strides on my home for years with this very thought, unaware it had an actual name. My best friend died after being in a coma for 30 days, at the age of w4. Her family was unable to clean out her very full apartment. I had to go through each item and deciding were it would go. There were a number of personal items I am sure she would have been horrified to know i had to find. This made me question my own possessions.. .what if this happened to me one day? I would not want someone having to sort through such large disorganized amounts of “things”. Great post! I’ve never read about Swedish death cleaning and where the idea comes from, but this is super interesting! Thanks so much for putting this info together. I totally am on board with decluttering. I agree it gives you a freeing feeling. I have 2 questions. 1. I’m married to a hoarder, do you have any tips? He goes through the rubbish and pulls out things that are broken “because I’ll fix it, one day” (my tactic to date is filling my friends rubbish bins). 2nd question. .. I feel guilty about things going to landfill so I donate to op shops, however am I just helping other people collect clutter?? 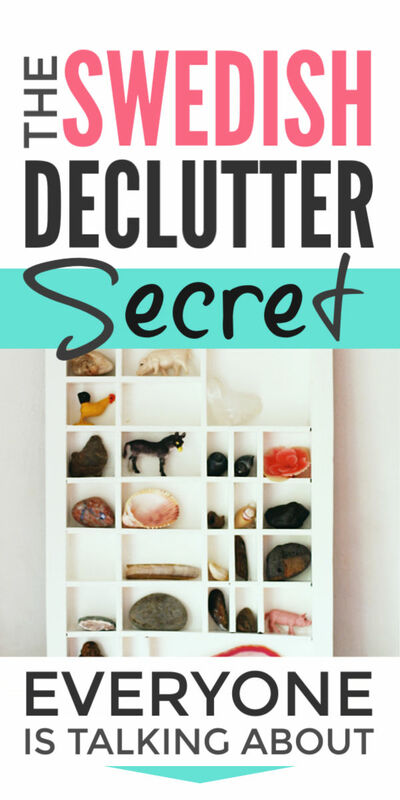 This is the best article on decluttering I have read! It has propelled me on my new journey to not burden my children with my junk. Both my husband’s parents and my parents had so much stuff, we are still sorting through it. I am determined to make it as easy as possible on my kids. Thank you for your words, they were very encouraging to me.